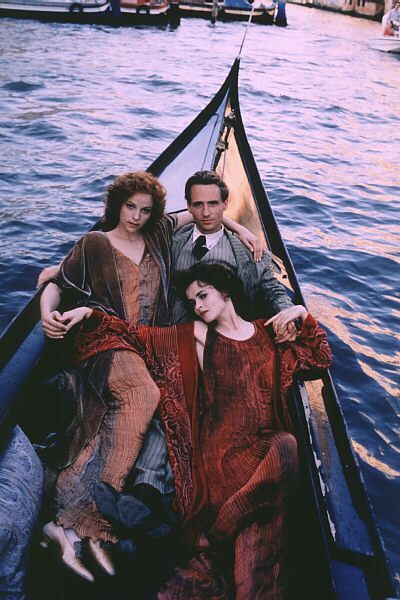 Patricia was originally asked to make a dress each for Charlotte Rampling and Helena Bonham-Carter by Sandy Powell. After the dresses had been fitted and delivered Sandy Powell’s assistant rang very early one morning to say the director loved the clothes and wanted lots more. So she and Patricia went through colours, styles and ideas and figuring out what they’d like and what Patricia thought would be possible. The final question was, when would they be needed. The answer? In Venice by four o’clock the next morning. Every other order was instantly dropped as the whole team shifted gears and launched onto a completely different trajectory. They systematically went through all stock to see what could be pulled together at the last minute. This is of course fairly common in the film industry. Things move exceptionally fast. Fascinating considering that many films take years in the planning, making before being screened in the cinemas around the world. Garments already created were the first to be included in the list then we went through and rapidly collated fabrics and part made garments that could be miraculously transformed into dazzling finished creations by the end of the day. Courier booked, parcel being packed and we thought we were done. However our triumph was somewhat short lived. To the not-so melodious tones of the parcel tape dispenser strapping up the package, the driver announced that he would not wait. A few seconds later we were left with a beautiful wrapped box with no one to get it to the airport. I am sure that this too is a fairly regular occurrence in the film industry. What might not be quite so common is the fact that it ended up being our coal merchant Sue, who drove her van with our precious cargo and delivered it to Heathrow in plenty of time for them to star on the silver screen. It was well worth the effort and more than satisfying to witness Sandy Powell being nominated for Oscar for the costumes. If Titanic hadn’t been such a huge success then perhaps she would have won and we could have all basked in the glorious glow of global acknowledgement. Of course, we did do that anyway as the film was so well received and is still being enjoyed today having become a bit of a classic in its own right. 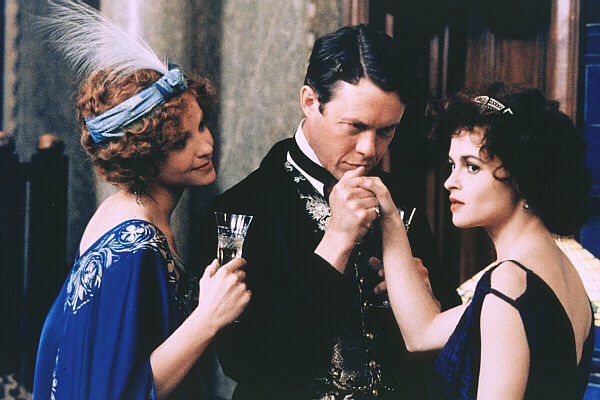 “The liquid velvets and shimmering silk pleats worn by Helena Bonham Carter captured in their ever-changing surfaces the elusive elliptical spirit of the movie based on Henry James’s novel. Yet the outfits worn by the main characters and by supporting actors, such as Charlotte Rampling, were not specially designed. Sandy Powell, the film’s costume designer, approached Patricia and Charles Lester – and just picked pieces from their current collection. Known for their exceptional fabrics and rich Renaissance colors, created from a secret formula similar to the work done by Mariano Fortuny in Venice at the turn of the century, the Lesters have carved out a unique place in international fashion. Their fluid kimono coats and neoclassical pleated dresses, all hand-dyed or printed in their Welsh workshops, are worn by women of independent spirit and artistic bent who want modern evening clothes that are outside the fashion loop. It is their combined sense of history and modernity that made the clothes appropriate to the movie, whose dates were moved from 19th to 20th century to take in the first stirrings of the rebellious unconventional modern woman. The loose easy drapes were in symbolic contrast to the structured and stuffy clothes of the Victorian and Edwardian eras.